When fresh and unfaded, Clitocybe odora is a gorgeous shade of bluish green and smells strongly of anise (like black licorice or ouzo), making it a fairly unmistakable mushroom. 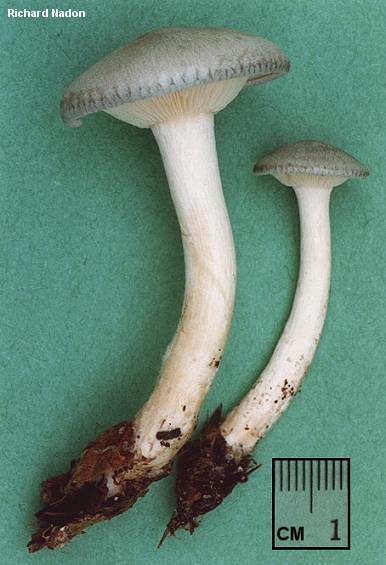 Whitish specimens are not uncommon, however, as a result of fading or lack of moisture (or sometimes simply because they're whitish)--and if these have lost the anise odor they can be rather difficult to separate from a host of similar Clitocybe species. Ecology: Saprobic; growing scattered or gregariously on hardwood litter in eastern North America and on the debris of conifers (or hardwoods) from the Rocky Mountains westward; summer and fall (or winter in warmer climates); widely distributed in North America. Cap: 2-11 cm; convex with an inrolled margin at first, becoming flat or shallowly vase-shaped; dry; finely hairy or smooth; blue-green to greenish, sometimes with a paler central area; fading quickly; in dry weather sometimes whitish; the margin often lined at maturity. Gills: Attached to the stem or running down it; close or crowded; whitish to pinkish buff (or, in the Pacific Northwest's var. pacifica, green like the cap). Stem: 2-8 cm long; up to 15 mm thick; more or less equal; dry; finely hairy; whitish (green or greenish in var. pacifica); with copious white mycelium at the base. Odor and Taste: When fresh, strongly of anise. Chemical Reactions: KOH on cap surface erasing green to pale orange. Spore Print: Pinkish to creamy. Microscopic Details: Spores 6-9 x 3.5-5.5 µ; elliptical; smooth; inamyloid. Cystidia absent. Clamp connections present. REFERENCES: (Bulliard, 1784) Kummer, 1871. (Fries, 1821; Saccardo, 1887; Kauffman, 1918; Bigelow, 1982; Phillips, 1991/2005; Lincoff, 1992; Horn, Kay & Abel, 1993; Kuyper, 1995; Barron, 1999; McNeil, 2006; Miller & Miller, 2006.) Herb. Kuo 09109604, 10050501.